From nearly anywhere in the Ojai Valley with a view of Nordhoff Ridge, you can see this one. The skeletal remains of what is easily the most-visited lookout site in the southern Los Padres overlooks Ojai, Rose Valley, and commands views still sought after by local hikers. A seven-mile approach via the Gridley Trail, the lookout lends excellent views of several of the prominent Ventura County peaks, most notably Chief Peak (the highest point along Nordhoff Ridge) and Hines Peak (highest point in the Ventura County frontcountry), both to the east. A P-51 Mustang crashed into the mountain just below the lookout here in 1944, but most evidence of the crash has long since been recovered (or pilfered), and what remains is pretty difficult to reach. The lookout’s original wooden cab was destroyed in the 1948 Wheeler Springs Fire. 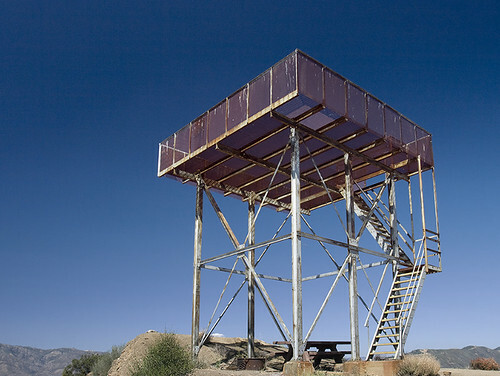 Its replacement (helicoptered over from Rincon Mtn in ~1950) burned in the 1970s; now only the steel frame stands. And despite the visitors who come from Lion Canyon, Gridley Canyon, Rose Valley, and Pratt, it remains a pretty lonely spot … sitting atop the Tower campground and its namesake ridge, bereft of its former importance and left to endure the winds and weather in lonely repose. 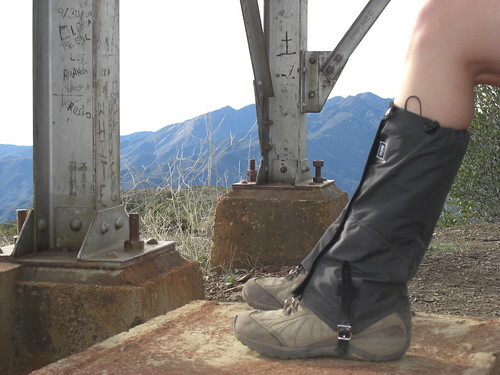 What’s with the gaiters? Ticks? Brush? 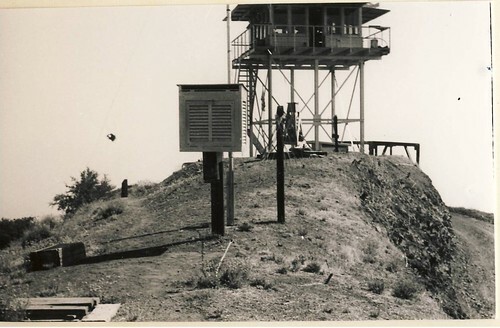 I enjoyed reading this post about the Nordhoff Peak tower. It has always held some allure for me, not to mention that I look upon it from my house in the east end of Ojai. I also love the fact that it is the apex of a great running or riding route from three cardinal directions. My first trip up there was a full-moon mountain bike ride up Gridley Cyn when I was 15. I didn’t know about the P-51 accident; it makes the spot all the more interesting.